The 2016 Honda Accord Sedan (automobiles.honda.com/accord-sedan/) and Coupe (automobiles.honda.com/accord-coupe/), named 29 times to Car and Driver magazine’s coveted “10Best” list, have received a 2015 TOP SAFETY PICK+ rating from the Insurance Institute for Highway Safety (IIHS) when equipped with optional front crash prevention from the Honda Sensing™ suite of driver assistive technologies. This distinction includes a top rating of GOOD in five different IIHS crash test modes including a GOOD score in the IIHS’s stringent small overlap frontal crash test. The 2015 TOP SAFETY PICK+ designation is awarded to vehicles that also have an available front crash prevention system that earns a superior or advanced rating from the Institute. The 2016 Accord Sedan and Coupe offer available frontal crash prevention systems that earn a top rating of superior. Featuring a host of new standard and available technologies, the ninth-generation Accord Sedan and Coupe offer a wide range of active and passive safety and driver assistive features and technologies. 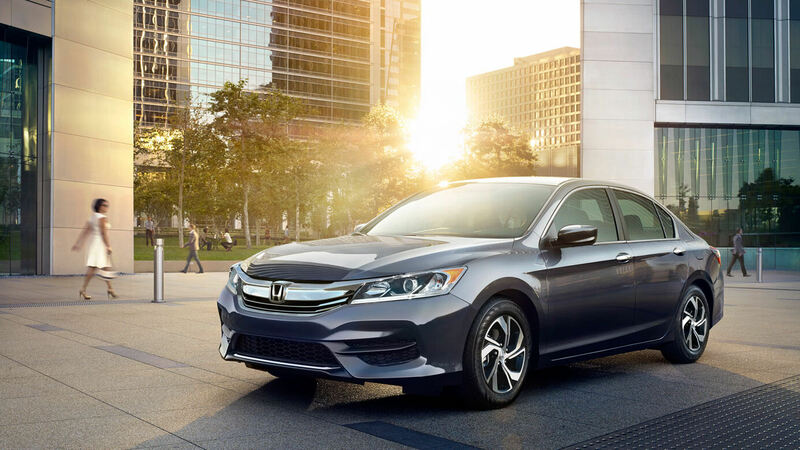 For 2016, all Accords can be equipped with Honda Sensing™, the most comprehensive suites of advanced safety and driver-assistive technologies offered in the midsize class. These systems benefit from the adoption of sensor fusion technology that integrates the capabilities of a windshield-mounted monocular camera and front grille-mounted millimeter wave radar system to provide enhanced sensing with the ability to identify and anticipate multiple collision scenarios, including ones involving a pedestrian. When the system anticipates a collision, it can initiate warnings and, in some cases, initiate emergency braking. Honda Sensing™ is available as a standalone option on LX, LX-S, Sport, EX and EX-L trims and offered as standard equipment on the Touring trims. All 2016 Accords feature a standard Multi-Angle Rearview Camera and Expanded View Driver’s Mirror. Also, for the first time, Touring trims feature new auto high-beam headlights, which enhance nighttime visibility and driving convenience by automatically defaulting to the high-beam setting and switching to low beams when an oncoming vehicle is detected. Collision safety engineering in the Accord is also significantly enhanced, due to a next generation Advanced Compatibility Engineering™ (ACE™) body structure. More extensive use of high-tensile steel allows a high level of protection to be provided while reducing the weight of vehicle structures. An important evolution of the previous system, the next generation ACE™ improves occupant protection and crash compatibility in frontal collisions. In the event of a frontal collision with a pedestrian, as with other Honda models, the new Accord also has an impact-absorbing front body design to help reduce energy from the force of the impact. Honda Safety Leadership Honda has a long history of leadership in the development and application of advanced technologies designed to enhance the safety of all road users, including automobile occupants, motorcycle riders and pedestrians. The company operates two of the world’s most sophisticated crash test facilities, in Ohio and Japan, and is responsible for numerous pioneering efforts in the areas of crashworthiness, airbag technology, collision compatibility and pedestrian safety. The company is broadly applying advanced driver-assistive technologies such as LaneWatch™, Forward Collision Warning and Lane Departure Warning to its product lineup and has applied rearview cameras as standard equipment to 100-percent of its line-up for 2015. First applied to the 2015 Honda CR-V, Honda Sensing™ is now available on the 2016 Pilot and Accord models and will soon be available on the 2016 Civic models. 2 LDW only alerts drivers when lane drift is detected without a turn signal in use. LDW may not detect all lane markings or lane departures; accuracy will vary based on weather, speed and road condition. System operation affected by extreme interior heat. Driver remains responsible for safely operating vehicle and avoiding collisions. 3 FCW cannot detect all objects ahead and may not detect a given object; accuracy will vary based on weather, speed and other factors. System operation affected by extreme interior heat. FCW does not include a braking function. Driver remains responsible for safely operating vehicle and avoiding collisions. 4 Road Departure Mitigation only alerts drivers when lane drift is detected without a turn signal in use and can apply mild steering torque to assist driver in maintaining proper lane position and/or brake pressure to slow the vehicle’s departure from a detected lane. Road Departure Mitigation may not detect all lane markings or lane departures; accuracy will vary based on weather, speed and road condition. System operation affected by extreme interior heat. Driver remains responsible for safely operating vehicle and avoiding collisions.